After our successful performance at the cure season opening at Bad Durkheim in 2005, our halau Noho ka manawa i Hula alapa’i was again asked to perform at the opening on the 1st Mai 2006. 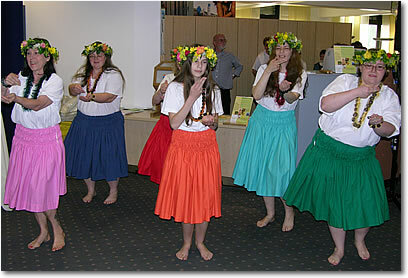 Our group of six dancers – Andrea, Evelyn, Gabi, Karin, Pauline and Stefanie – took the audience on a trip over the different hawaiian islands. We performed Hukilau, Puamana, Makee ailana, Pu’u anahulu, He nani ka ala and Song of old Hawai’i. The audience enjoyed our dancing and looked forward to the second part of our performance. After a short break we continued our program with love songs like Papalina lahilahi, Hawaiian Hospitality, Hula Girl, Green Rose Hula and Moonlight Lady. We closed our program with a lovesong to the Aina – This is Hawai’i. The audience was very interested and asked us several questions about Hula. Afterwards the director of the medical cure center thanked us for our performance.